We found this Galloping Lady Reykjanes Peninsula the other day. We were going to photograph the big breakers coming in from the Atlantic. It was extremely windy. All of a sudden this lady comes galloping down the mountainside the wind sweeping her up into the air every now and then. She did escape unharmed. Made for a nice silhouette though. We operate tour the whole year around in the Reykjanes Peninsula. 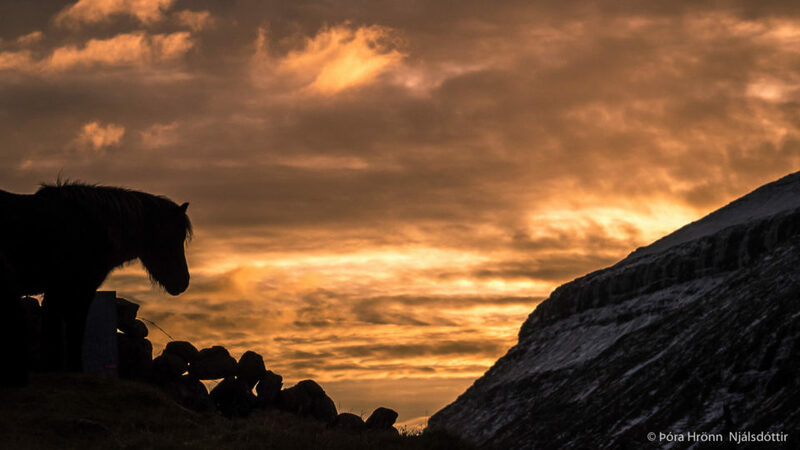 We exhibited photographs in the Faroe Islands during the Faroe Islands Literature Days and found this Faroe Islands Horse. The day after the opening we started out in total darkness and drove north to Saksund fjord to photograph the beautiful Duvugardur Musem. When we arrived there at sunrise this horse welcomed us and my wife took this photograph. A most memorable morning. 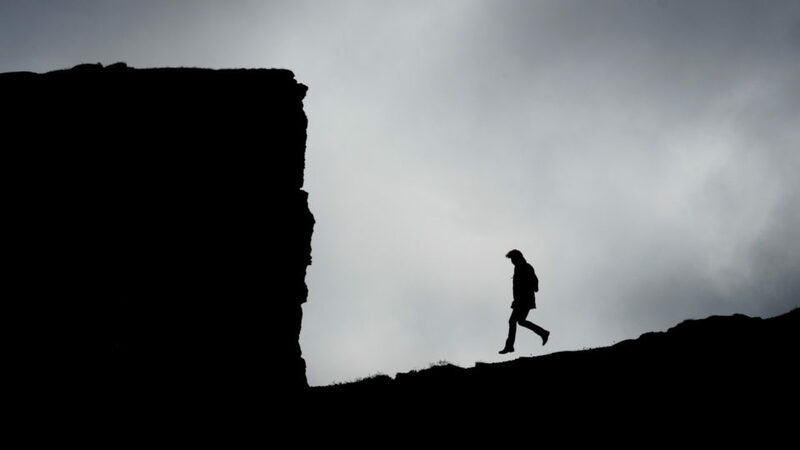 We organise a photography tour to the Faroe islands. The Iceland Ptarmigan (Lagopus muta) Rock Ptarmigan is a tundra bird. It changes color from white in winter to brown in summer. The English-language name ptarmigan is derived from the Scottish Gaelic tàrmachan. The Icelandic name is rjúpa. 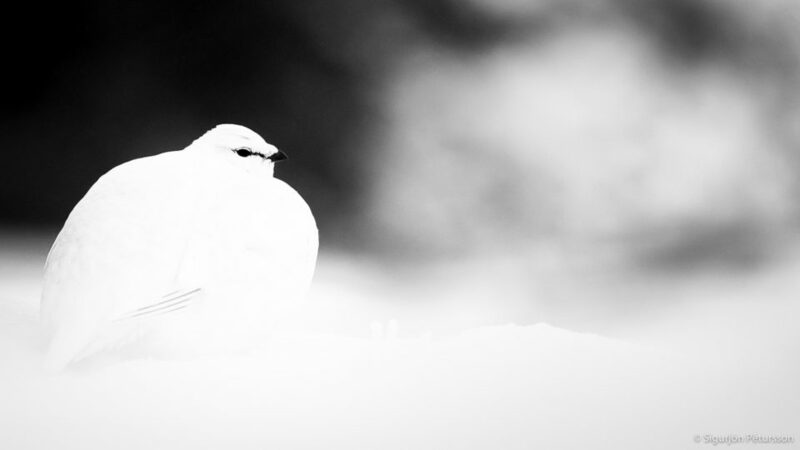 We the Icelanders have a strange relationship with this small beautiful bird. For eleven months each year we admire its beauty and perseverance. Then during November we hunt it and a Christmas dinner is not a Christmas dinner in many Icelandic homes unless there is ptarmigan on the table. This photo of the ptarmigan was a happening. It was the moment. Most bird photography involves waiting and patience. This photo we took when going to the Dettifoss waterfall in January. We had just parked our snowmobiles above the waterfall when we spotted this one. It was 15°C so the feathers of the bird are raised in order to keep it warm. Also in such cold most life calms down and the bird allowed us to come up close. Come with us on our Iceland Bird Photography Tours. An ice bow in Scoresby Sound Greenland. Ice crystals suspended in the atmosphere create icebows. This results in a wide variety of coloured or white rings, arches and spots in the sky. 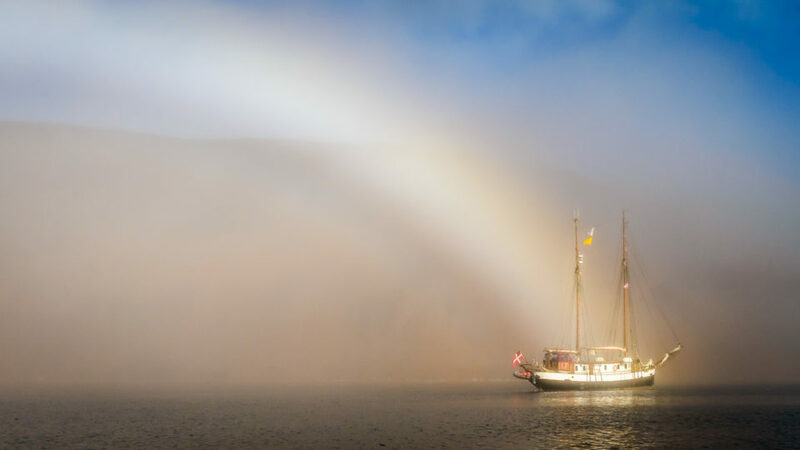 On our kayaking trip in Scoresby Sound, Greenland an ice bow greeted us as we came back to our ship. Why not hop over to Greenland for one or two days after a tour with us around Iceland? We can arrange such combos. The place is named after the English Arctic explorer, scientist and clergyman William Scoresby. Scoresby mapped the fjor area in detail in 1822. It is a large fjord system of the Greenland Sea on the eastern coast of Greenland and is one of the largest and longest fjord systems in the world. It has a tree-like structure, with a main body approximately 110 km (68 mi) long that branches into a system of fjords covering an area of about 38,000 km2 (14,700 sq mi). The longest of the fjords extends 340–350 km (210-216 mi) inland from the coastline.The depth is 400–600 m (1,310-1,970 ft) in the main basin, but depths increase to up to 1,450 m (4,760 ft) in some fjords. On the northern side of the mouth of the Scoresby Sund stands Ittoqqortoormiit, the only permanent settlement in the region, with a population of 469 (in 2010). 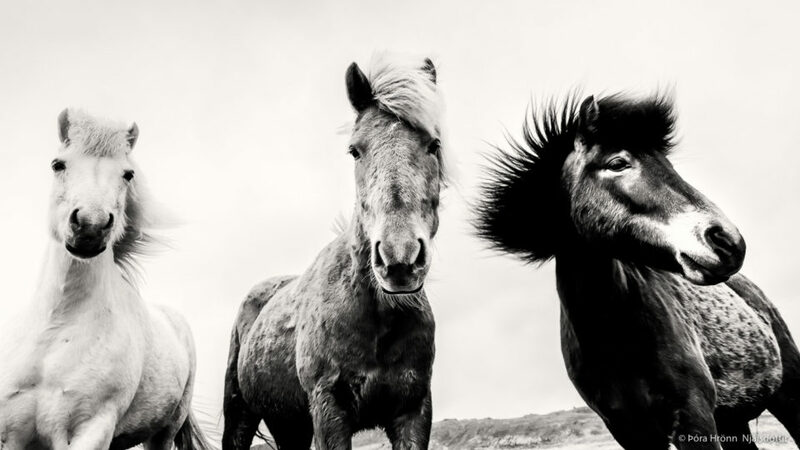 When taking this photograph of Icelandic Horses it was very windy and hard to hold the camera still. Also because of the wind the horses did not stand still for long. So we clicked away and hoped for a good one. This is what we got. Three real characters. Icelandic horses are hardy, long lived and have few diseases. Icelandic law prevents horses from being imported into the country. Exported animals are not allowed to return. The Icelandic horse displays two gaits in addition to the typical walk, trot, and canter/gallop commonly displayed by other breeds. The earliest Norse people venerated the horse as a symbol of fertility. White horses were slaughtered at sacrificial feasts and ceremonies. When these settlers arrived in Iceland, they brought their beliefs, and their horses, with them. Horses played a significant part in Norse mythology, and several horses played major roles in the Norse myths, among them the eight-footed pacer named Sleipnir, owned by Odin, chief of the Norse gods. The most popular bird among foreign photographers in Iceland is by far the Puffin and in May to July it is Puffin time. The Atlantic Puffin (Fratercula arctica) usually simply called the Puffin, is a member of the auk family. It is the most common bird in Iceland. The population is estimated at 8-13 million individuals and 3-4 million breeding pairs. The upright stance as well as the black and white plumage of auks reminds some people of penguins although the two families are in fact not related. Because the puffins are so numerous in Iceland they can be found in many places all around Iceland. They are easy to photograph in the breeding grounds and allow humans to come quite close. This photograph is taken on an island to the north of Iceland up by the Arctic Circle June 22 during the night. The night that never comes as this is summer solstice day. 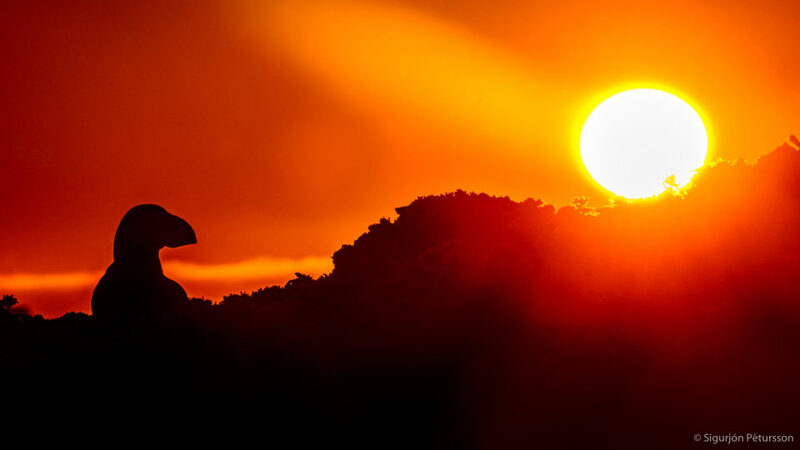 We offer bird photography tours at Photo Tours in Iceland. 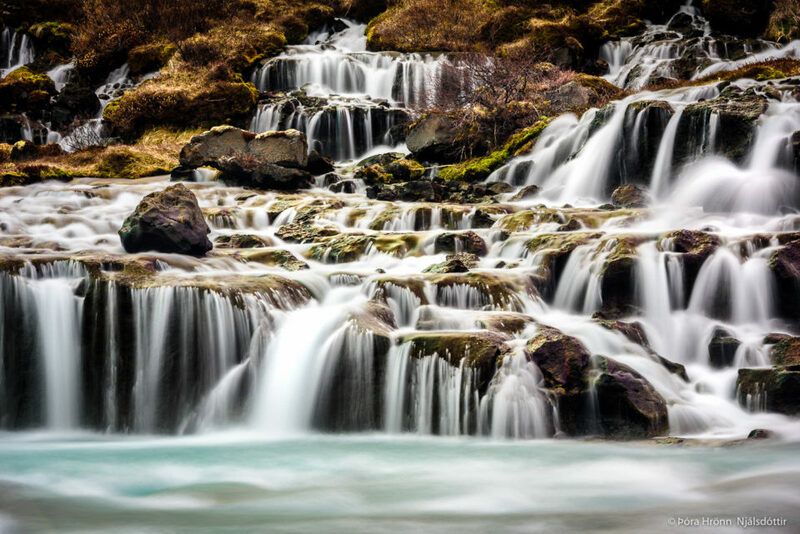 The Hraunfossar waterfalls West Iceland are a series of waterfalls almost a km in length. The crystal clear water spouts out in numerous rivulets from the lava field of Hallmundarhraun entering a glacial river coloured white by silt from the Langjökull icecap. The photographic opportunities at this location are such that one can spend days exploring no matter what the season. The possibilities are endless be it night or day, rain or shine etc. only limited by creative abilities and patience. 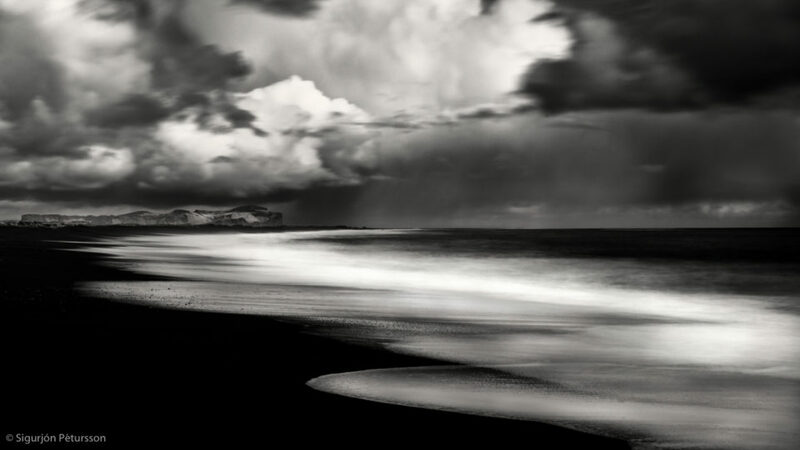 Photographing water can produce exquisite silky smooth beautiful photographs. It requires a technique we will teach you on our tours. You will need a tripod as this type of photography involves keeping the shutter open for longer than you can hand hold you camera. The shutter speed can range most of the time from 1/8 of a second up to 2-4 seconds. It all depends on what type of image we want to create and at what speed the water is flowing. In order to slow the shutter so much down you will need a neutral density filters (ND). The easiest in our experience is to use a variable ND filter. At the top of the Hraunfossar waterfalls are the Barnafossar waterfalls. Many Icelandic folk tales have been associated with Barnafossar, the most famous being about two boys from a nearby farm, Hraunsás. One day, the boys’ parents went with their ploughmen to a church. The boys were supposed to stay at home. They grew bored and decided to follow their parents. They made a shortcut and crossed a natural stone-bridge that was above the waterfalls. But on their way, they felt dizzy and fell into the water and drowned. When their mother found out what had happened, she put a spell on the bridge saying that nobody would ever cross it without drowning himself. A little while later, the bridge was demolished in an earthquake. We are tour operators. We are Photo Tours in Iceland and organise tours to waterfalls. 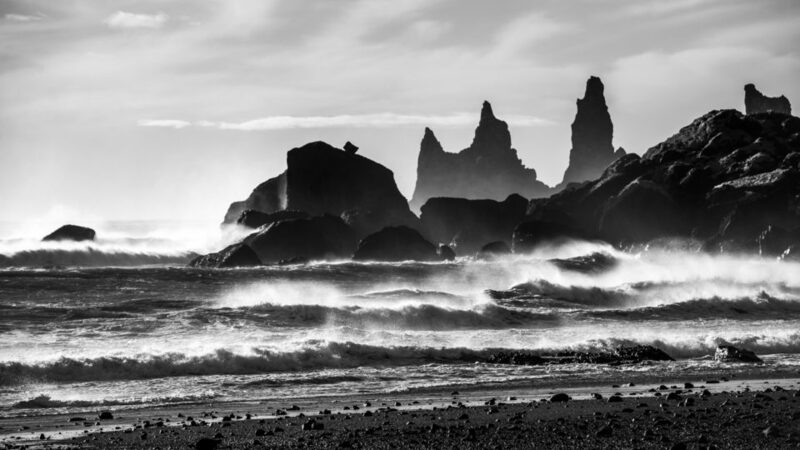 Black beaches, breakers, cliffs, and rock formations characterise the South Coast of Iceland. No matter what the weather brings us this magnificent world never ceases to amaze. No day is the same as the other. The day I took this photograph was perfect for this kind of photography. Big clouds with showers coming in every now and then. Wind with breakers. Magnificent, magical and somehow soothing. Every now and then a wave coming in slowly and then receding. Again and again and again. A real symphony. Before we talk about all those beaches in more details, you might be wondering why the sand is black in Iceland. Well, first of all, Iceland is volcanic. NO kidding? So the black sand and pebbles are tiny fragments from the basalt lava that covers the area. Yesterday’s afternoon drive to Vik on the South Coast of Iceland. The light was magnificent. It rained for five minutes, then the sun came out for five minutes, then it rained again for five minutes and so on and so on. Coming back over the mountains we had fresh snow on the ground. One of Iceland’s most beautiful areas in our mind is the Langisjor lake area. 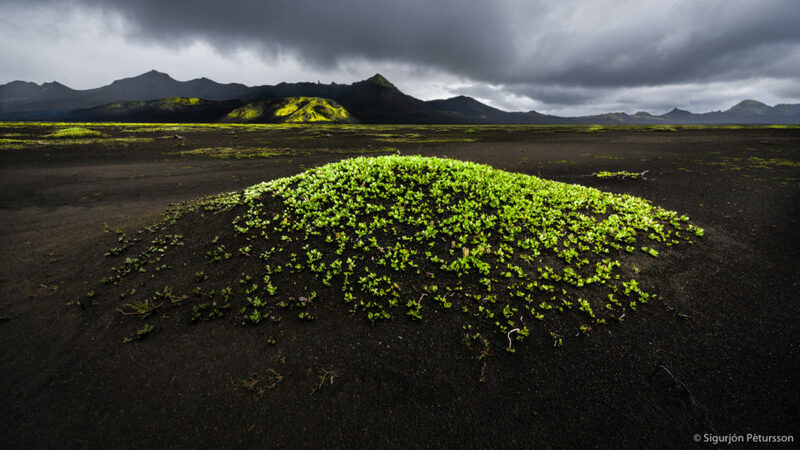 Everything is covered with black ash which is covered here and there with super green moss and sparse vegetation. The best moments for photography are just after the rain stops. Then the blacks are black and the greens are green. 20 April is the last day of winter according to the Icelandic Calendar. This winter we have had a lot of storms with magnificent waves that break upon our beaches. 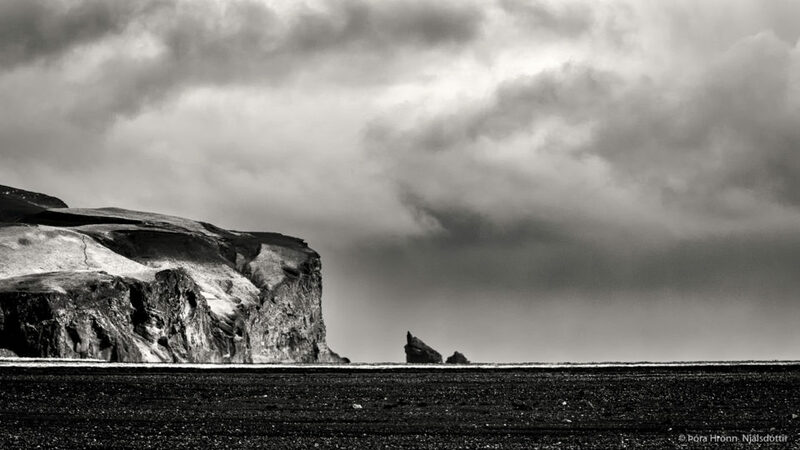 One such place is the Reynisdrangar basalt sea stacks near the village of Vik, South Iceland. These are framed by a black sand beach which has been ranked as one of the ten most beautiful non-tropical beaches in the world. Legend says that the stacks originated when two trolls dragged a three-masted ship to land unsuccessfully and when daylight broke they became needles of rock. 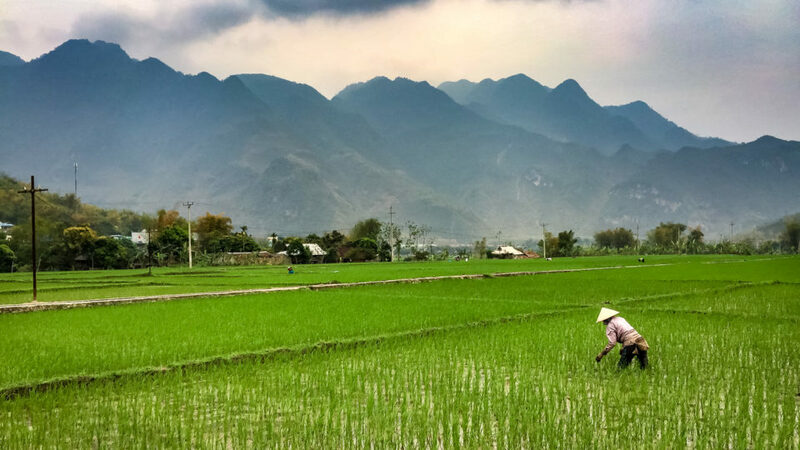 Motorcycling Vietnam through the rice paddies. Beautiful. Just finished a 2.100km motorcycle trip with my wife, daughter and son-in-law from Hanoi to Ho Chi Minh City, Vietnam. Travelling light with only the IPhone as a camera. Post processing in Snapseed on IPhone 6Plus.